Its time for another scifi-themed brew day! And an experimental brew-day at that. This post’s beer is a split-batch of chocolate stout, with each half of the batch fermented with yeasts not normally used for the style. Clockwork is fermented with the Voss Kveik strain of Norwegian farmhouse yeasts, while Sawbones is fermented with Wyeast’s Brettanomyces lambicus. I’ve brewed with the Voss Kveik strain several times, including for an Advent beer a few years ago. This strain has become one of my favourite strains. It is very clean at relatively warm temperatures (mid-20C’s/70F’s). But ferment it warm – and by warm I mean 35-40C/95-104F – and it throws a beautiful citrus/orange flavour. Chocolate and orange are a classic flavour combination, and as such I was very curious to see how the Kveik would work in a super-malty, chocolate-forward beer. 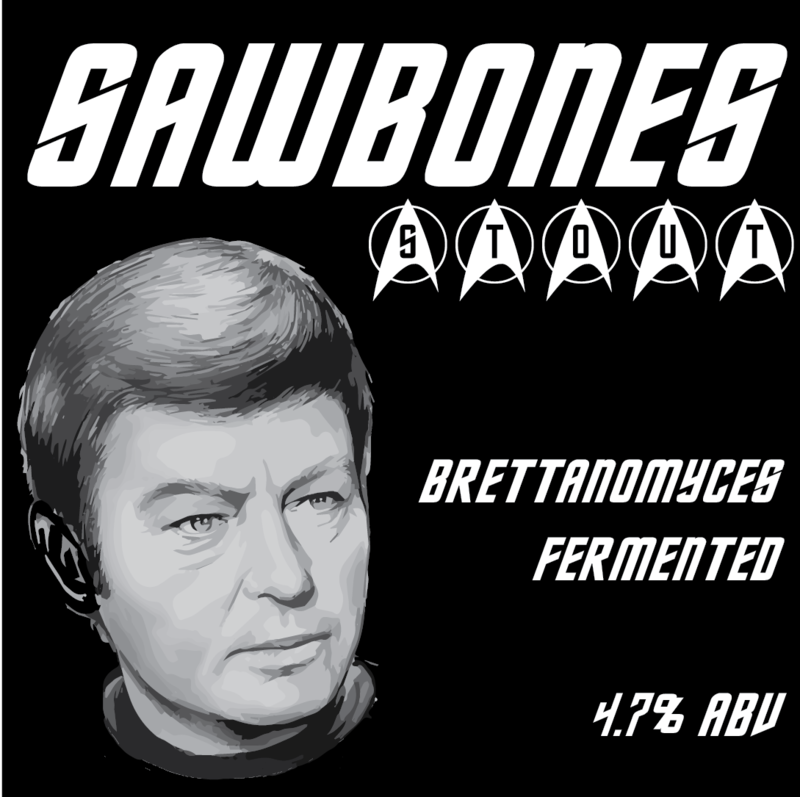 I’ve also brewed a few all-brett batches with Wyeast’s Brettanomyces lambicus. This yeast produces an amazing cherry-ester profile. As with orange/chocolate, cherries and chocolate are another classical flavour combination that I think will work well as a malt-forward chocolate stout. …Sawbones is a bit more of a stretch – cherries + chocolate is, in cake form, a black forest cake. For some reason, in my brain, forest = DeForest Kelley, the indomitable actor who played Dr. Lenard “Bones” McCoy in the classical Star Trek series. “Bones” is short for “sawbones” – an old slang term for “doctor”. So the name is somewhat of a six-degrees of separation thing (or, perhaps, a sign of my impending insanity). 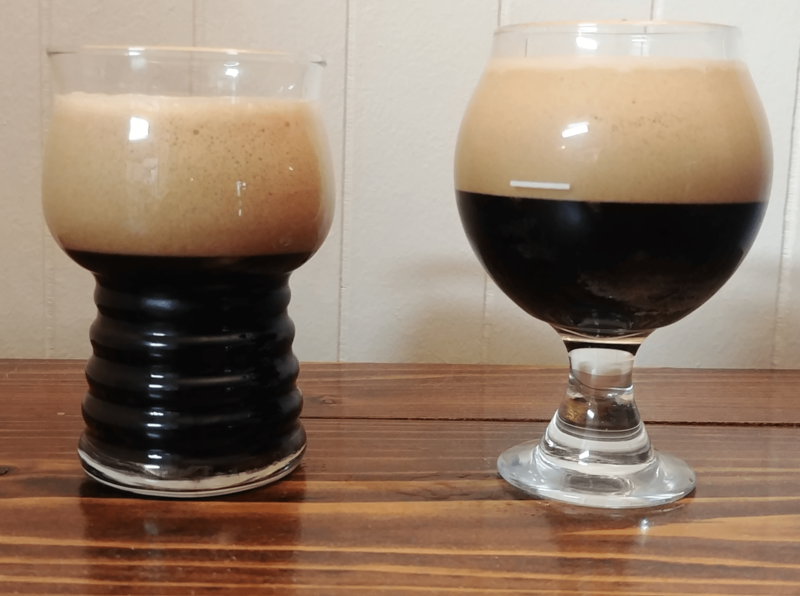 The base recipe is the same for both beers; a recipe I had originally named “cacophile’s stout” (chocolate lover’s stout). I had to rename it to stick with my scifi theme for 2018…and I’m not sure I like the new names better. I’ve never brewed this as a straight-stout, so I have no idea if it is any good. The idea is to make a malt-forward, richly chocolate stout. To achieve this I aimed for lower bitterness – a BU:GU ratio of 0.75. To further sweeten the beer, I added rich base malts (maris otter & munich) and a hefty dose of crystal. I also made use of some debittered dark malts to bring up the colour and chocolate flavours, without adding too much astringency. For a final chocolate wallop, I added bakers chocolate to the boil. I also prepared a chocolate extract (similar to the nut extract used in benders two nuts) to add post-fermentation if needed. I also added an additional 2 g of sodium bicarbonate to the mash water as a pH adjustment. I aimed to brew 24L of beer, which after a split would give me enough for 12L of beer fermented with each yeast. I.E. enough to enjoy if its good, and a small enough amount to choke down if its bad. Mashed for 45 min at 68.9C, then batch-sparged to collect 32 L. Boil for 1 hour. I live tweeted this brewday, and got a number of fun videos and pictures. Unlike my last brewday, this one went almost flawlessly…except somewhere along the line I mis-measured my water and collected 8 L of wort more than planned. I boiled for an hour to get the beer to the planned pre-boil gravity, and then brewed as planned. Even so, I ended up with an extra ~3L of wort, and correspondingly, the OG was slightly low (1.053). I’m hoping this doesn’t mess up the bitterness ratio too much, but the high doses of munich and crystal malts should carry this beer through even if the bitterness is a tad high. I’ve never added chocolate to a beer before, but my wife knew all the tricks and it went without a problem. The “secret” is to finely chop the chocolate, and to that you add 2-3 volumes of hot wort. Let sit 5 minutes, stir, and you’ve got nicely liquefied, easily poured/blended chocolate to add to your beer. In my case, I added hot wort from the boil kettle when there was ~20 minutes left in the boil, and blended the chocolate/wort mixture back into the beer with ~10 minutes left in the boil. The key to both of these beers is fermentation temperature. To draw out the orange character from the Kveik I need to keep the beer above 35C; my experience with the Brettanomyces is that I get the best cherry character (without unwanted off-flavours) around 22C-24C. In other words, these beers need to be warm. I placed the Clockwork portion into a keg and wrapped a brewbelt + temperature controller around it, insulated with a bit of water heater insulation, and set the temperature for 37C. My basement is cold (12-14C), so even with the insulation the controller struggled to keep the temperature up, but it held the beer above 35C, so it was good enough. The Sawbones went into a 12.5L carboy wrapped in a brewbelt. This held the carboy at 22-24C (the temperature varied, depending on where I measured), which was good enough. I held Clockwork at temperature for 4 days, and then began dropping the temperature 2.5C/12 hours (5C/day) until the beer was cooled to 20C. The beer was held at 20C for its final 7 days of fermentation (over a 13-day fermentation schedule) to allow for any off-flavours to be cleaned up. The sawbones was held at 24C for the 13-day duration of the ferment. Not only did I ferment warm, but I also under-pitched each yeast to draw out even more of the orange/cherry character. Both beers were pitched at ~0.1 million/ml/plato, which is much lower than the 0.75 million/ml/plato normally used for ales. Even so, the Kveik fermented out in a day, and Sawbones in about two days. Sawbones then proceed to form a gnarly pellicle which became more and more beautiful as the beer aged. 13 days after brewday I siphoned Sawbones into a carboy, and used a jumper line and a bit of CO2 pressure to move Clockwork into a clean keg. The kegs were loaded in my new keezer (which is still a deep freeze; conversion to a keezer is going to be a summer project). A few days at 30 PSI pressure and both beers were ready to pour. Appearance: Pours midnight black, with a thick but course beige head. Aroma: Aroma is chocolate with a citrus note. Flavour: This beer is somewhat disappointing. The kveik dried this beer out far more than expected, leaving the beer far less sweet than planned. As a consequence, the beer is a bit off balance, and even with the modest amount of roast and relatively low bitterness, the beer leans a bit more towards a harsh/bitter character than I prefer with the chocolate character very prominent. The hoped for citrus character is present…but I made a mistake. The kveik would have worked very well with an American-style stout, where there would be a healthy dose of citrus-forward hops added late in the boil. This beer lacks that character, and instead has a dose of English-style hops that add a earthy/herbal character that conflicts with the citrus from the kveik. Mouthfeel: The beer is medium-bodies, which is a bit thin given the intended character for this beer. Aftertaste is a lingering citrus/herbal note with a touch of sweetness. Overall: A bit of a disappointment. My exploration of kveik yeast in dark beers will continue, but future experiments will focus on more hop-forward styles, focusing on hops with citrus and fruit notes. Appearance: Pours midnight black, with a thick viscous beige head. The head on this beer is really something; the brett really contributed to a creamy, thick head on this beer. Aroma: Aroma is a strong chocolate/coffee roasted aroma, with hints of stone fruits and earth. Flavour: Brewing dark beers with Brettanomyces can be challenging, as the flavours of Brettanomyces (and their purported ability to convert rast-associated phenols into other flavours) can lead to a harsh beer. Despite this, I’ve had luck adding brett to dark-ish beers in the past. I may have pushed the roast malts too far this time. The flavour up-front is fabulous – rich, licentious chocolate and coffee flavours, malty, and a blast of cherry that makes it hard to believe that cherries were not added to the beer. The bold roast character typical of stouts is present, but is a minor player compared to the chocolate and cherries. 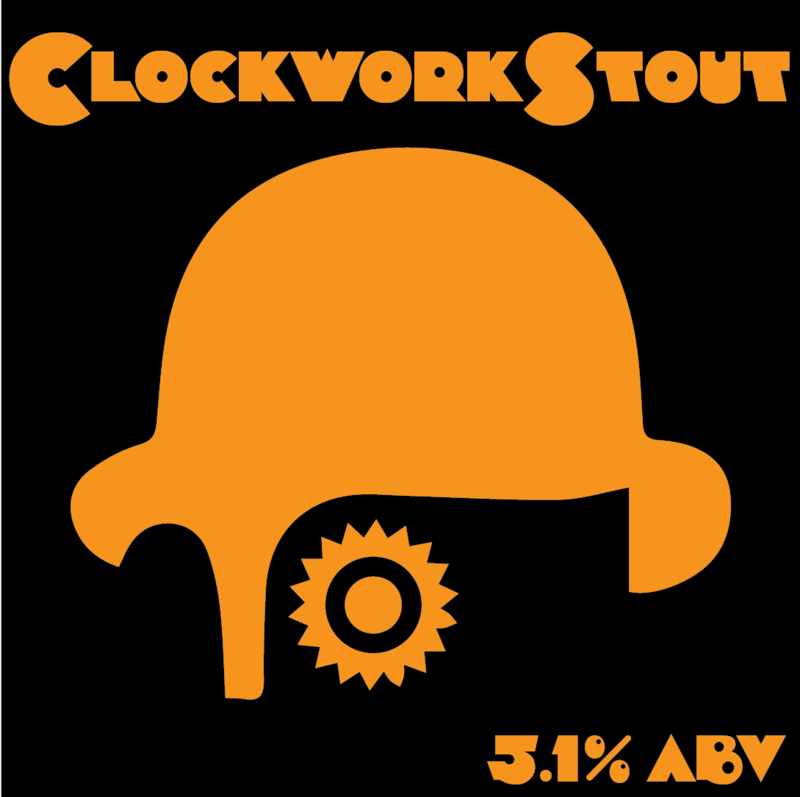 As with Clockwork, the flavour hop addition adds an herbal character that is out of place. Regardless, at first sip, this beer is nearly everything I hoped it would be. However, this wonderful, rich beer fades to expose a hard-to-describe harshness that I think is a product of brett’s interactions with the dark malt. As the flavour fades into the aftertaste a strong dirt/dust character emerges that is accompanied by a chalk-like mouthfeel. Luckily, this doesn’t last long, but it is a character that I’ve not encountered before, and it detracts quite strongly from the overall enjoyment of the beer. Mouthfeel: When you first sip this beer it is rich, thick and sweet. But, as I mentioned above, this fades into an unusual drying sensation that feels like there is chalk or another mineral precipitating in your mouth. So the beer starts off wonderful, and ends poorly. Overall: To some extent I achieved my goal with this beer – a strong cherry note in a chocolate stout, using only yeast and creative recipe formulation to generate the desired fruit-forward character. However, something about how the brett interacted with the dark malts produced an unpleasant aftertaste and mouthfeel that detracts from the overall character of the beer. I wouldn’t brew this particular beer again, but considering my success with all-brett porters and brown ales, this semi-success gives me the motivation to try a paler beer with a similar cherry/chocolate character…perhaps an imperial brown ale! ← The Drought Is Over! Craft Brew Review – 4 great beers.